This scrapbooking idea is a very fun one. 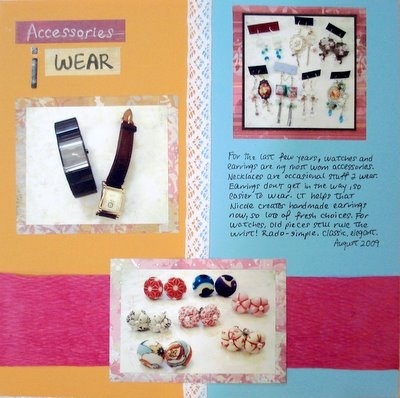 It’s to scrapbook about the accessories you wear! Ok, you might not be a person that pays much attention to your accessories. Even in this case, I believe you have your favorite watch or a necklace that you wear all the time? Scrapbook that. And if you’re like many women, you probably have a collection of accessories! How fun is that? So pull out your scrapbook supplies and start celebrating your current favorite pieces! Be it two or twenty pieces, document them in your scrapbook page so that years later, you could go back and recall fond memories of your once-upon-a-time accessories that so dazzled you. For me, in the past I had a small Swatch watch collection. Now I have 4 pieces of watches, none of them Swatch. And out of these four, I mostly just wear one of them. I’m more of a earring person. That’s because I find earrings easy to wear and they don’t get in the way. Be it studs or dangling earrings, I have them. It certainly helps that my sister Nicole creates many pretty handmade earrings (many mismatched earrings too) for her blogshop. That’s how I have a small collection now. I’ve chosen some of my favorite accessory pieces to feature in this layout. The pairs of earrings shown on the right is my current fave from her creations. This week’s idea should be an easy one for you to scrapbook about. Have fun and showcase your personal taste! Supplies used: Cardstocks – Bazzill Basics; All patterned papers – Basic Grey “Perhaps Collection”; Hot pink crepe paper – from stash; Lace ribbon – Daiso Japan; Alphabet sticker – American Crafts “Thickers – Vinyl”; White pen – Uni-Ball “Angelic Colour”; Black pen – Zig Memory System “Millennium”; Sketch: No. 276 of 500 Scrapbooking Sketches.